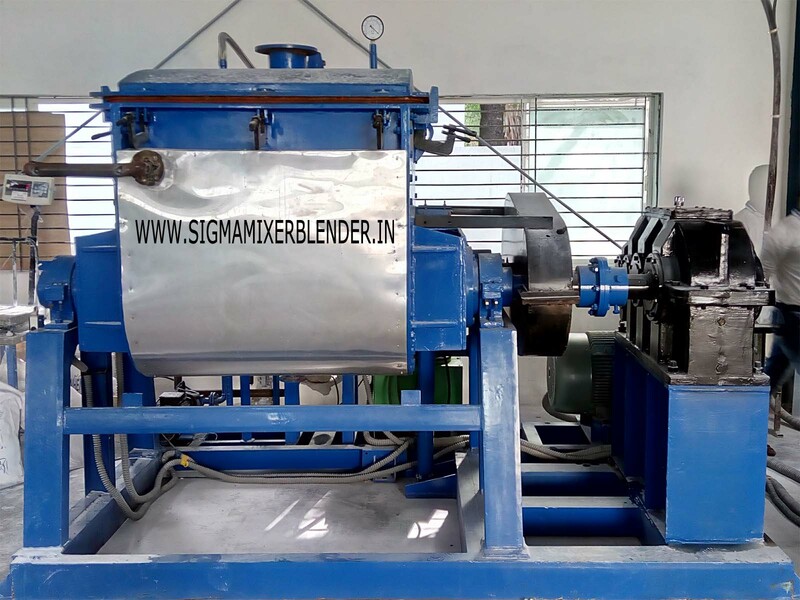 Stainless Steel Sigma Mixer (kneader) for Gum is a twin basin kneading machine with two horizontally arranged kneading blades, which are deeply geared into one another and strip themselves reciprocally. The kneading blades run to a ratio 1:2 Because of their different speed, the blade sides approach and withdraw alternately. This causes high pressure tensile and shearing rates and therefore heavy friction in the kneading medium, which creates excellent dispersing and homogeneity. The shape of the kneading blades enables a steady flow of material from the side walls of the kneading trough to the middle of the kneading trough..
Each blade moves the material in opposite direction thereby providing excellent cross mixing of all raw materials. The blades pass the trough walls and each other at close clearances resulting in good mixing. The close clearance produces a shearing and tearing action that is beneficial to the size reduction of solids. This mixer is most suitable for highly viscous material and dough like masses. On completion of the mix cycle, the trough of the mixer is tilted and the product is discharged. Kneader is a kind of ideal high-performance equipment for mixing and kneading high viscosity and super high viscosity materials. Vacuum Kneader is widely used in such industries as high viscosity sealant, silicone rubber, CMC, battery, ink, dye, pharmacy, resin, plastics and cosmetics, etc. Kneader temperature adjustment can be done by using heat transfer oil circulation, electric heating, steam and water cooling. It can be made tank body jacket, wallboard jacket, stirrer passing cooling water, passing heat transfer oil and such structures for heating and cooling.